Detailed instructions supplied. Type: 1 Drawers 1 Door 3 Shelves. Drawer size : 66W x 11cmH. Overall size: 80W x 47D x 92cmH. (Wire Basket and Cabinet. Steel basket and cabinet. With Drawers，Wine rack. Smart And Compact Design That Allows For Easy Storage. & Sun.Excluded). 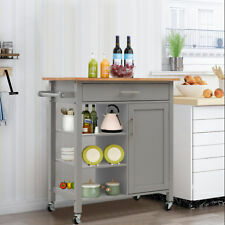 Portable Kitchen Trolley Wood Cart Storage 3 Drawer Shelf Fruit Vegetable Drinks 84 high 63 wide 32cm deep Really nice heavy duty trolley cart. Can have so many applications from the kitchen to the workshop. Lower shelves can be removed. Plain on reverse side. Lovely hand built item, a really stylish eye catching trolley. Very heavy collection only, courier would probably come to £50 Local delivery possible Royston 30 miles. Thank you for looking. Feature with 1 worktop, 1 drawer, 1 cupboard, 3 storage shelves, 1 towel rail. 1x Kitchen Trolley. Material : MDF Wood. It can be used as an island within your kitchen or for added storage in the bathroom, dining room, garage, laundry room, nursery, or the bedroom. Feature with 1 worktop, 1 drawer, 1 cupboard, 3 storage shelves, 1 towel rail. 1x Kitchen Trolley. It can be used as an island within your kitchen or for added storage in the bathroom, dining room, garage, laundry room, nursery, or the bedroom. Sideboards can be raised Wheels for easy movement In-built wine rack Removable tray --- . Integrated granite chopping surface Natural pine wood Coordinating knife holder Generous storage space . 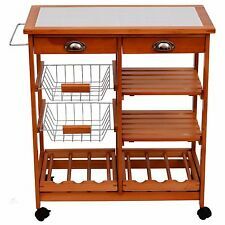 1x Wood Kitchen Trolley. Shelf Size: (L) 33 x (w) 40cm. legs Height (Wheel): 13.5cm. Drawer size : (L) 66 x (H) 11cm. Overall size: ( L ) 80 x (W) 47 x (H) 92cm. The serving trolley features with 3 tier shelves which can provide rich storage space. With light weight and foldable design, it can be transported easily. 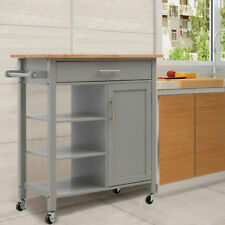 1 x Kitchen serving trolley. Lightweight and fully foldable design is ideal for transporting and storing in compact space. The 6-bottle wine rack on the bottom allows easy storage for champagne wine or even beer. Drawer Size(Inner): 26.6 W x 28.1 D x 5.0 H cm. of Wine Bottle: 6. Basket Size: 28.0 L x 29.1 W x 6.0 Hcm. Pull Out Shelf Size: 30.6 W x 30.6 D cm. • Solid pine wooden trolley with white finish and bamboo worktop. • With Wine racks for storing up to 9 bottle of wine. • Drawer Size: 30.0 W x 33.0 D x 7H cm. • 2 pull out drawers and a cabinet allow for item storage. This bamboo kitchen trolley boasts multiple tiers of shelving. Kitchen Trolley. Space-saving Trolley with a modern design. 1x Kitchen Trolley. A versatile storage unit for most kitchen needs. The design makes it ideal for most kitchen sizes and decor while the. Manufactured from durable MDF wood. Natural wood (beech color) tabletop/towel rail and pine wood legs. Cabinet and drawers and others made using MDF. Colour: Black Beech. Material: Chipboard/MDF, Pine Wood, Stainless Steel Handles. Drawer Size: W49.5x H14cm. Made of light, smooth bamboo, this kitchen trolley features two sideboards attached to its table top which can be raised or lowered to elongate it. Materials: Bamboo. 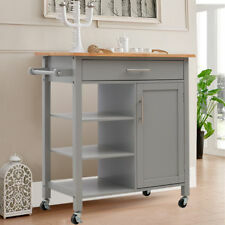 This kitchen trolley is on wheels, making it easy to transport from room to room carrying food and dinnerware. Made of beautiful hevea wood, this trolley is sturdy and durable. It features two drawers and two shelves, making it ideal for transporting food and tableware between the kitchen and the patio for a portable al fresco dining experience. Multiple shelves and cabinet, drawers provide enough storage space. Kitchen Island Unit. Roomy top surface doubles as bar or display space.